Upon arrival in Beijing meet the local English speaking guide and transfer to the hotel. Lunch not included. In the afternoon visit The Temple of Heaven 天坛, considered one of the most remarkable examples of the ancient Chinese architecture. Then you can stroll along Liulichang 琉璃厂 the famous antiquarians, calligraphers and artists street. Buffet dinner at the hotel. The whole day is dedicated to discover the heart of the city. The visit starts in Tian’an men Square 天安门广场, namely The Gate of Heavenly Peace，where there are The Mausoleum of Mao Zedong, The People’s Palace, and The National Museum Monument to the People’s Heroes , then visit The Forbidden City 故宫, the Chinese imperial palace from the Ming Dynasty to the end of the Qing Dynasty. Lunch at local Chinese restaurant. In the afternoon visit The Summer Palace 颐和园, dominated by Longevity Hill and the Kunming Lake. Banquet dinner to taste the traditional Beijing Roasted Duck. After breakfast, visit The Badaling Great Wall 八达岭长城, approximately 50 miles long, that is the most famous section of the Great Wall of China , the only place in the world visible from the moon. Lunch at a local Chinese restaurant. In the afternoon visit The Ming Tombs 城陵 and The Sacred Road 神路. Dinner at a local Chinese restaurant. After breakfast, transfer to the airport to take the direct flight to Xi ‘An. Upon arrival, meet and greet with the new local English speaking guide. 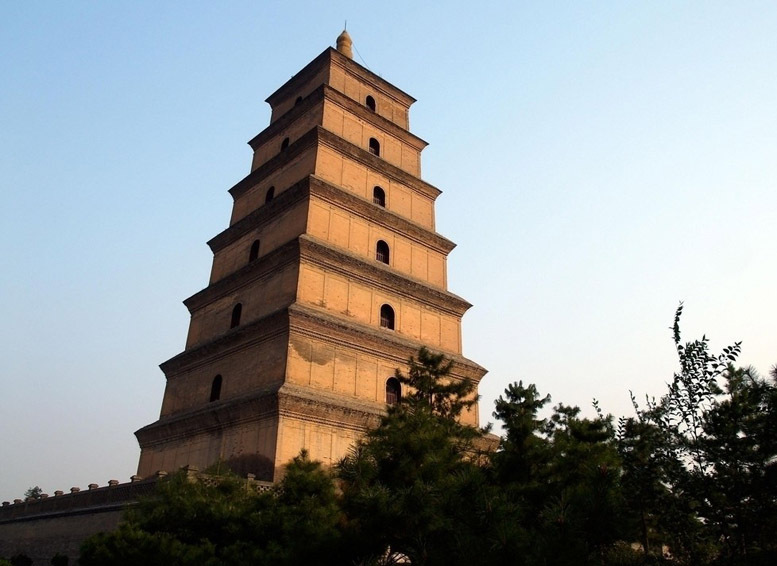 After lunch in a local Chinese restaurant, visit The Giant Wild Goose Pagoda 大雁塔. After breakfast, meet and greet with the local English speaking guide and transfer for the visit of The Terracotta Warriors site 兵马俑, made up of more than 8.000 stone warriors statues to guard the tomb of the First Emperor Shi Huang Di. Lunch at a local Chinese restaurant. Return back to the city, visit The Old City Walls 古城墙 and The Great Mosque 清真寺. Dinner at a local Chinese restaurant. After breakfast, transfer to the airport to catch the flight to Guilin. Upon arrival meet and greet with the local English speaking guide, then lunch at a local Chinese restaurant. 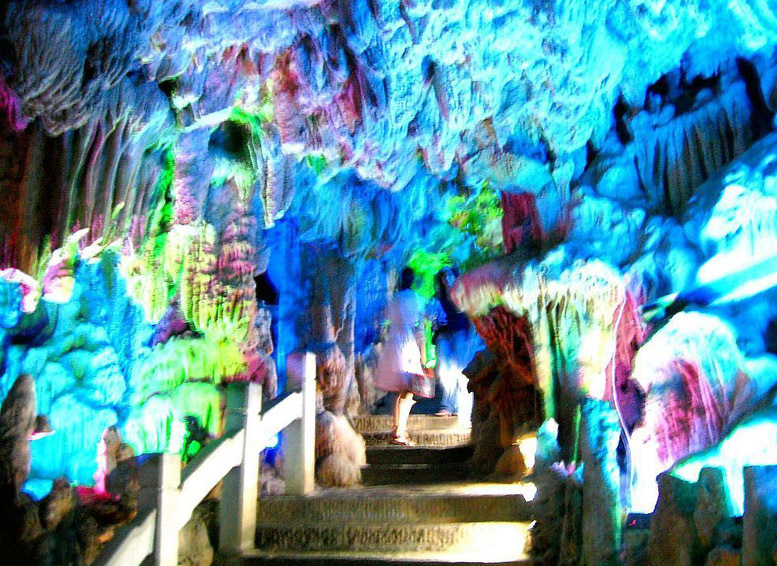 In the afternoon visit The Reed Flute Cave 芦笛岩, spectacular composition of different stalactites, stone pillars and rock formations, created by carbonate, known as the Palace of Natural Arts. Dinner at a Chinese local restaurant. After breakfast departure to visit the rice terraces Longji Terraced field 龙脊稻田 in Longsheng 龙胜This is one of the twelve most suggestive sites of the Guanxi Province. 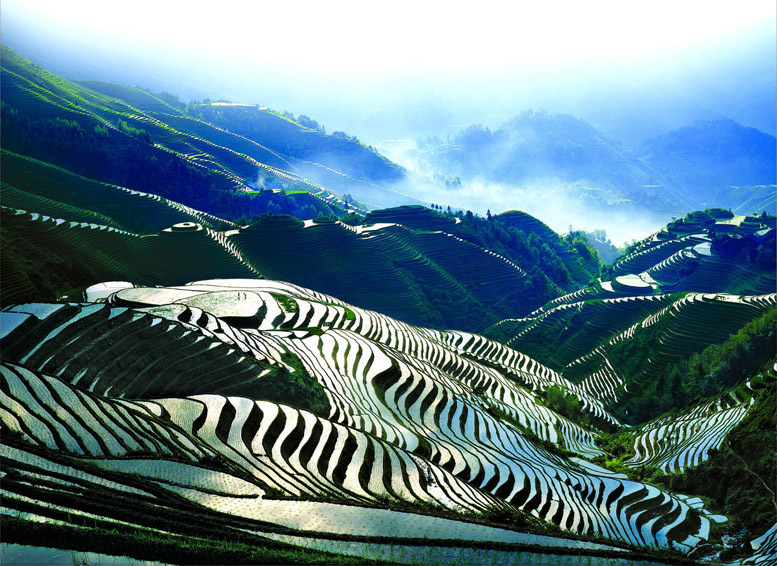 The construction of the terraces started more than 600 years ago, during the Yuan Dynasty, and ended at the beginning of Qing Dynasty. Lunch at a local Chinese restaurant. In the afternoon back to Guilin. Dinner at a Chinese local restaurant. After breakfast, transfer to Guilin’s pier for The Li River Cruise 漓江游船从桂林到阳朔 (around 5 hours). 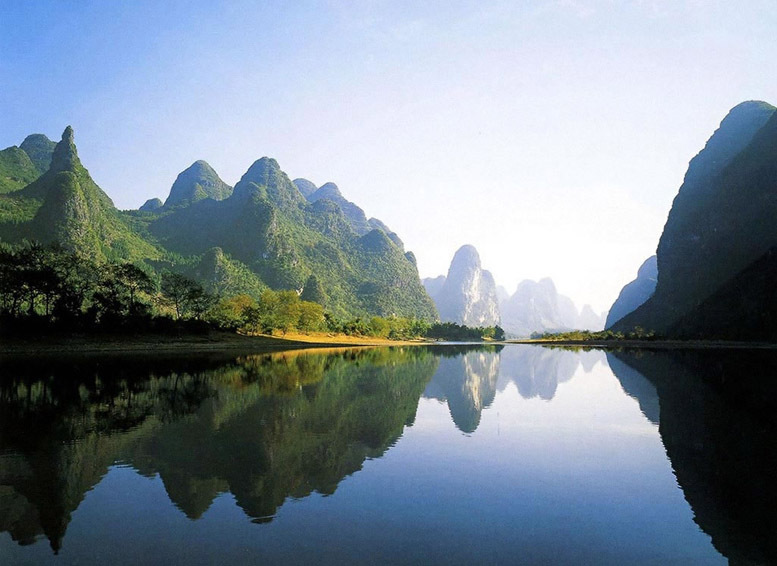 During the cruise you can admire the beautiful landscapes, represented by several generations of Chinese painters. Buffet lunch on board. Around 2 pm arrival in Yangshuo. In the afternoon free time at your disposal. After breakfast, meet the English speaking guide and transfer to Guilin’s airport to take the flight to Shanghai. Lunch on board. Upon arrival at Shanghai, meet the new English speaking guide and transfer to the hotel. Feel the city lively atmosphere with a walk through The Nanjing Road 南京路, commercial center with lots of shops and shopping malls, next to The Bund 外滩, the famous walk on The Huangpu river bank, where you can admire the amazing Shanghai skyline. Dinner at a local Chinese restaurant. After breakfast greet and meet with the local English speaking guide, then visit to Jade Buddha Temple 玉佛寺, built in 1882 to gather two jade statues brought by Huigen Monk from Burma in Shanghai and a walk through the colonial quarters. Lunch at a local Chinese traditional restaurant. In the afternoon, a visit to Yu Garden 豫园, built in the second half of 1500, destroyed during the Opium Wars, then repaired by the Shanghai government. Chinese style dinner at a local restaurant. After breakfast, transfer to the airport to take the flight back to your country.